Summer is for Grilling! Happy 4th! Prep and Clean: Clean your grill before and after use. Heat up your grill on high to clean off any unwanted mess. A clean grill ensures fresher tasting food and fewer carcinogens left on the grates. Easy Clean-up Tip: Cover your entire grill area with aluminum foil for easier clean up and to protect your grill. 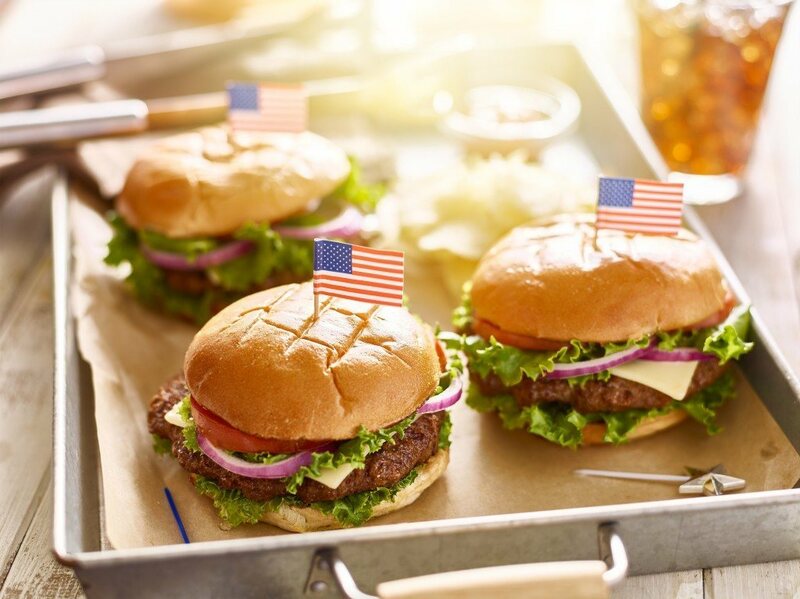 Don’t Flatten Burgers, Steaks & Chops With the Spatula: We see it in movies, tv shows and commercials, but flattening these items on the grill only squeezes out the flavorful juice and can cause flare ups! Marinating meats intensifies the flavors and adds juiciness that everyone craves. But did you know that it is also healthful? Marinating meat prior to grilling can reduce the amount of HCA’s (Heterocyclic amines) that can form on meat exposed to high cooking temperatures. HCA’s have been shown to possibly increase the risk of certain cancers in animal studies. According to the American Institutes of Cancer Research®, studies show that using marinades prior to grilling can reduce the amount of HCAs formed during grilling. Choose lean cuts of meat. Prior to grilling, remove skin from poultry and trim fat from beef. Grill veggie burgers, turkey and chicken burgers and even tofu for delicious additions to your barbecue! Meats should be completed thawed before cooking for proper flavor and even cooking. Marinate meats in the fridge – discard unused marinade. Use separate cutting boards and utensils for raw meats and vegetables. Cook steaks to 145 degrees Fahrenheit, 160 degrees for ground meats (hamburgers) and 165 degrees for chicken. Refrigerate foods after two hours or less. Don’t forget to wash your hands before, during and after grilling! Grate peel and squeeze 2 Tablespoons juice from orange; reserve juice. Combine orange peel, cilantro, paprika, and ground red pepper, if desired, in a small bowl. Cut beef steak into 1-1/4 inch pieces. Place beef and 2-1/2 tablespoons cilantro mixture in food-safe plastic bag; turn to coat. Place remaining cilantro mixture and fruit in separate food-safe plastic bag, turn to coat. Close bags securely. Marinate beef and fruit in refrigerator 15 minutes to 2 hours. Place kabobs on grid over medium, ash-covered coals. Grill beef kabobs, covered, 8 to 10 minutes (over medium heat on preheated gas grill, 9 to 11 minutes) for medium rare to medium doneness, turning occasionally. 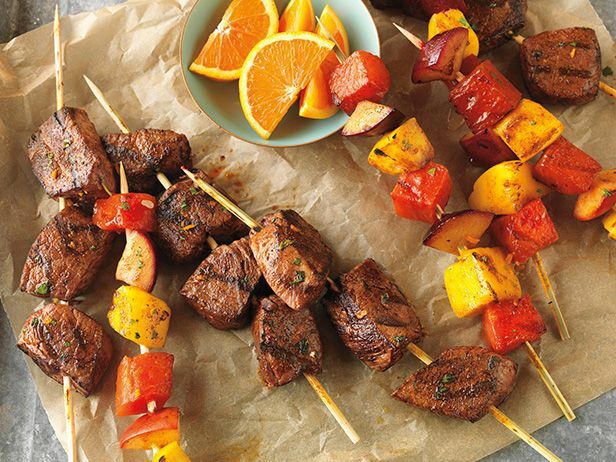 Grill fruit kabobs 5 to 7 minutes or until softened and begging to brown, turning once. Nutrition Information: 239 calories; 6g fat (2g Saturate, 2g monounsaturated); 70mg cholesterol; 57mg sodium; 20g carbohydrate; 2.4g fiber; 27g protein.